. إن الخدمات التي يقدمها فاليو إن داروين تضمن للنزلاء إقامة مريحة. يمكن للنزلاء الاستمتاع بالميزات التالية: مكتب الاستقبال على مدار الساعة, مرافق مخصصة لذوي الاحتياجات الخاصة, تسجيل وصول/خروج سريع, تخزين الأمتعة, واي فاي في المناطق العامة أثناء إقامتهم في هذا المكان الرائع. في الفندق غرف نوم يتجاوز عددها 91، كلها مجهزة بعناية وجمال وبعضها مزود بـ غرف لغير المدخنين, مكيف هواء, مكتب, ساعة منبه, اتصال لاسلكي بشبكة الإنترنت (تطبق الرسوم). يقدم الفندق مجموعة رائعة من الخدمات كمثل حمام سباحة خارجي, سبا, حديقة، لجعل إقامتك تجربة لا تنسى. إن فاليو إن داروين هو خيارك لخدمة الفنادق الراقية في داروين. smack in the middle of everything. we were able to check in at 5am without extra cost which was great, night staff fella was very nice and helpful (big bold guy with nice eyes). staff were friendly and accommodating. worth every cent. small shower but thats ok. double and single bed in the room. good housekeeping staff. would definitely stay here again. This is a good location to the party area of Darwin. Lots of restaurants, bars and nightlife nearby. Surprisingly I did not hear any noise from my room on the 2nd floor. Air conditioning system worked well and there was a sign next to it informing guests never turn it off. If this bothers you, do not stay here. Pool area is small, but adequate for the value of this affordable hotel. Room was clean. Happy enough here for a budget hotel. We got in early at around 8 am but the friendly staff helped us to check in immediately and that was a huge relief! Value Inn is located in a lovely central area which is hugely convenient for getting around and picking up groceries from Coles and Woolworths! Location, Value for money and room cleanliness. Our overnight stay was good. The motel is located in Mitchell street which is centrally located in the main street of Darwin, close to shops and local watering holes. The motel is economical and the rooms are clean and tidy, it was a pleasant stay. Value Inn is a great option as a budget hotel. Rooms are small but have all the facilities needed for an overnight stay. It's a great base to explore the city centre. There is a bit of noise at night due to the convenient location next to restaurants and night clubs. It seems like the rooms towards the pool end of the building and facing the car park are quieter. It's not the Ritz, but good value for money. Very good, I arrived very early after traveling from Philippines, the woman on reception was very frendly and very helpful, and when they opened reception got me straight into a room. Great stuff, now I am a member of their VIP Club, as I work at sea and will return every 6 weeks. Many thanks for your help...Shane K.
Cheap and satisfactory, great position. Location is good ,staff helpful.rooms good size and clean Amenities like pool Good and maintained and Has open kitchen to prepare own meals or warm up takeaway. Provides good outback packages but be alert or they sometimes forget to wake you.Well managed-no nonsense tolerated and wi fi facilities .nearby to party bars and Coles retail store opposite. Its worth a try and i guarantee you will be back. I stay at this place very often to Darwin, during off peak they were offering low room charge and gave me a "Valued Customer Card" and promised me that if I stay with them during off peak they will continue to give me that discount during peak season as well. When I try to book this time (during peak) for 5 nights they denied and said they can't do that so I only stayed with them for one night since I was checking in at 1am and moved to Darwin Central Hotel which is much nicer. This place is getting old and tired. Staff are excellent. But mould and noise and age of building is let down. We paid $50 and wouldn't want pay more. Mainly because aircon above our aircon dripped on it all night long and we all had bad sleep! The staff were happy to help with things. But by the time we knew the noise it was too late. Also, the fire alarms have habit of going off and everyone has to evacuate! It is what it is...3.5 star is generous...but it is slap bang in the middle of Mitchell Street Darwin which for some people would be everything, but it is truly basic, although everything is in the room, and the room does stink to high heaven as one reviewer has observed, but if you open the window ( and thus the noise of Mitchell St.) and open the bathroom door and run the air conditioner on full blast and the fan in the bathroom you can get rid of the stink quite quickly...but my biggest gripe is the dishonest advertising, and the Value Inn is not alone in this, and it pisses me off no end...on two sites I looked at it said "Car Park" and "Free Parking" respectively, but there are only 35 spots and 90 rooms, so when I got there there was no parking and to be airily told that if I didn't like it I could get my money back infuriated me, because at that time the only beds in Darwin were $1200 and $1100 a night. When I made a fuss and told them they could pay the difference they found me a car park but it should never have come to that. It the advertising was honest and said "Limited free parking" or "Free parking subject to availability" as it should have done I would never have booked there...so as far as the Value Inn is concerned it is very much buyer beware. Facilities Are Quite old and you can't Expect it comfi, but staff was absolutely welcoming, Helpful in any Way. The thing what Brings the Evaluation over the top is the combination with the Hostel. Had an relaxing Time there, hanging around with Travellers all over the World ! Our stay here was pretty okay. Do take note to inform the hotel earlier if you want to check in earlier. We arrived in the early morning and we had to wait for the reception desk to open. Luckily it's connected to a bigger hostel next door which allowed us to store our baggage at. There's one main street of food and drinks in Darwin, and this hotel is located along that street. That made it a lot easier for us in terms of convenience. It's also really near a super market and the car rental store. The rooms are clean enough but you need to pay for wifi. The aircon is really pretty old but it'll suffice if you're not staying for too long and you're not too fussy. Central location, renovated & clean, friendly staff! Excellent stay! The hotel is freshly renovated, painted in a tasteful style, clean and very comfortable. Its central location is a bonus. I can recommend the hotel and I intend to stay there again myself. The staff is helpful and friendly. OK on the whole. Stayed there for an 8-hour layover after a camp in Kakadu and flight home. Three beds in a very small room. Great location. Airport Shuttle Transit Centre, eateries, pubs and the supermarket nearby. Have stayed here several times. Nothing special, but it has all the facilities needed sleep comfortably. Some rooms close to the nightclub can be noisy. To avoid the noise choose a room facing the car park at the pool end of the building. Lots of restaurants nearby. 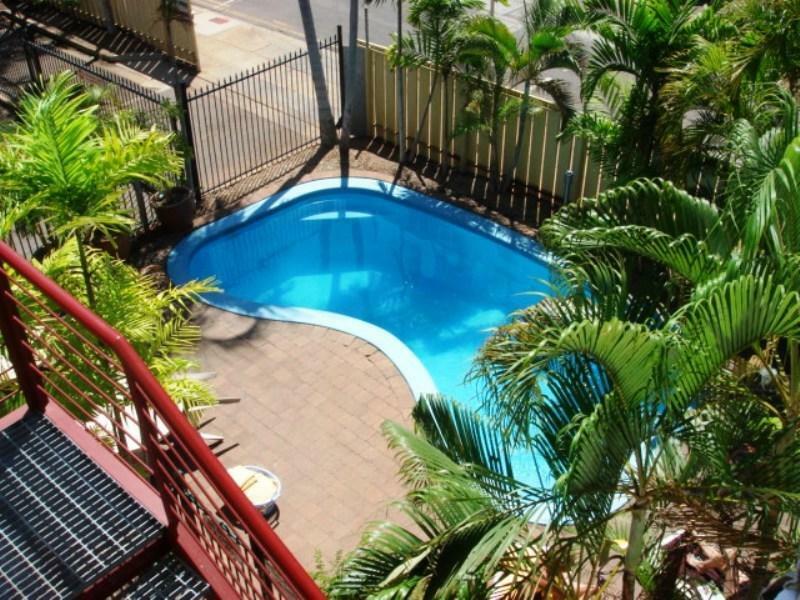 Central location, good value for Darwin and attached to the hostel. Here you get the best of both worlds. The hotel has private rooms for those of us who no longer can deal with bunk beds, yet is affiliated with the hostel next door. There you can use their facilities including the kitchen, pool and socialise. Then return to your private room for a good nights sleep. It is right in the centre of Darwin, close to everything and with plenty of opportunities to book tours if you wish. I am not all that sure about the star system, but it is a good basic, clean motel. Note that I had to leave something in the food/dining section. Their is no restaurant, but you can self-cater at the hostel next door. Their are plenty of places to eat in the neighbourhood. It was a very simple accommodation. If you are just looking for somewhere to rest after exploring the city in the day, this is probably a good place to stay at. 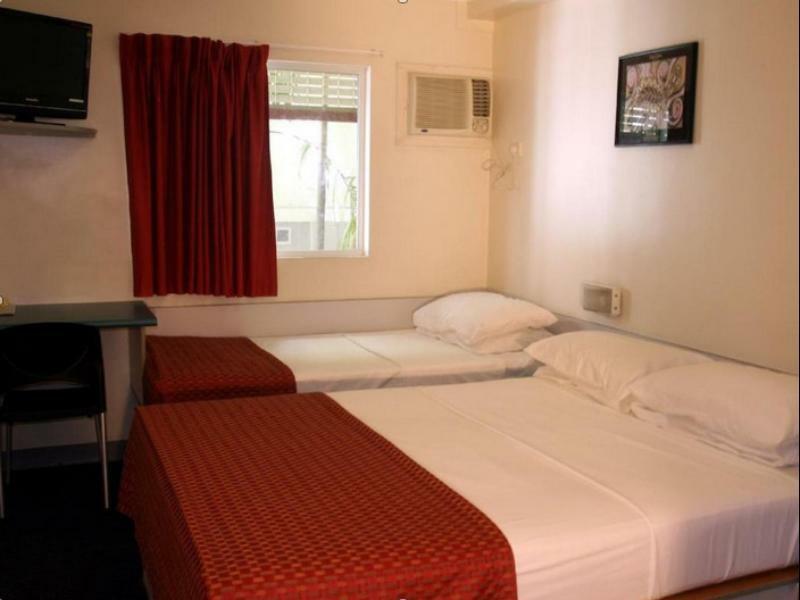 Cheap but small rooms, located along the most happening street in Darwin city. The main office is closed after certain hours but the hostel next door provides an alternative entrance for patrons. My stay was once again so pleasurable and relaxing, can't wait to return. The reception staff were so friendly and helpful. My room was so clean and comfortable. Wouldn't think of staying anywhere else.